I started playing the cello when I was 6. I'd been playing the violin from the age of 4 and singing (notably, as a mouse in Noye's Fludde) from 3. Six was also the age that I spent 18 months touring as the Page Boy in Verdi's Falstaff ... I've never really thought about it like that - cello and opera seeds sown simultaneously ... and though they grew at different rates, they've been intertwined ever since. From about the age of 12, not many days and nights would go by without my listening to Daniil Shafran's recording of Kabalevsky's 2nd cello concerto, Rostropovich's recording of Shostakovich's 1st cello concerto and Lynn Harrell's recording of Saint-Saens' 2nd cello concerto - preferably, multiple times. I used to think that - in the Kabalevsky - Shafran sounded like a cello-playing werewolf! That kind of blistering, devil-may-care, wildly precise cello-playing was and has remained a huge inspiration - I continue to channel my own inner werewolf! When I was 17, my teacher - Boris Pergamenschikow - introduced me to Galina Vishnevskaya and insisted that I sing to her. At that age, my speaking voice was strikingly low and Boris had been ... struck by it. Once I'd plucked up the courage, a Tchaikovsky song was plonked in front of me and Galina preceded to prod, thump, squeeze and cajole me into a very visceral, open-hearted connection with my singing voice. The vocal journey has been a long, fascinating and occasionally bewildering one since then but, strangely, my 17yr old experience is coming back into focus right now. So, here I am channelling werewolves, finding the visceral vocal connection, exploring the canon in ways inspired by the likes of Le Page's Elsinore and making new work that harnesses virtuoso classical chops to an overwhelming desire to connect with new audiences and with old audiences anew - which can mean engaging with new technology, creating theatrical, immersive domains in which to experience amazing music or sometimes just talking to people. These days, I would say my 'voice' is - more often than not - found in relation to an audience in the moment. I find someone like Bobby McFerrin really inspirational in this, and many other, ways. Through my re-creative (interpreting the canon) and creative (making sound, connections, improvisations and writing words and music) work, the thing I'm looking for most is a refreshing and uncluttered connection with an audience. So my development has been around learning how to tune out the frequently noisy and invariably unhelpful chatterings of so much 'classical' music prejudice and paranoia and tune into how music connects to the world and to people. 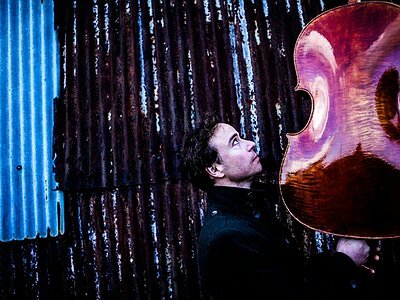 For the last 6 months I've been playing an extraordinary new cello by Robin Aitchison. Curiously, I've also had a vocal epiphany over that time - those intertwinings again! The relationship with it is free, easy, functional. With other cellos that's not always been the case. Most of the time, I want - and I want my audience to as well - to FORGET about the cello. Cellos and cello-playing are the least interesting things about cello music. So free, easy, functional is exactly what I'm looking for. It also clears the way for the inner werewolf, the uncluttered connection with the audience and the spontaneities of the day and night. I'm looking for the same thing with singing. Being tired, sick, busy can blur that relationship. But in those moments, trust of the visceral and the sensational can re-establish radio contact. There's also a kind of surrender in taking that step which leads to vulnerability; which is, I think, what we're all looking for - performers and audiences. In striving for the human touch in often very formal environments, I would often try too hard - become adversarial or provocative. But I firmly believe in the right to fall on one's face! And having done so innumerable times, I have learned, these days, to take an audience on an unknown journey by holding its hand rather than mugging it! Another big challenge has been my allegedly unorthodox, multi-faceted career. I was told so many times to make a choice and resolve what other people called the 'dilemma'. And I did, giving up one or the other discipline. But the 360-degree approach wouldn't go away, so I learned that it wasn't a dilemma, at least not for me, and that, in fact, the different disciplines a) weren't so different and b) informed and enhanced each other rather than compromised each other. And as I looked further back in history, I realised that the so-called 'portfolio career' was in fact normal/expected. Even as recently as Rostropovich and Domingo you have examples of fabulous, 360-degree musical artists (not to mention, in the case of Rostropovich, one-time Vogue editor and activist). How to make noise late without disturbing the kids/neighbours - criterion number one. Keeping it relatively clutter free, having pencils, practice mutes, current repertoire, a recording/videoing device, mirror handy - so a mood of calm functionality, making the most of often limited time. In getting an itch of an idea or feeling, or an interpretation, out into the world, I like to move, sing, let it all hang out - so room to swing cats, throw shapes, raise roofs. Could you take me through the process of interpretation on the basis of one of a piece that's particularly dear to you, please? What do you start with when working on a new piece, for example, how do you form your creative decisions and how do you refine them? Browsing, roughing out - that's where I start - with all of the tangents and chaos that comes with those activities. Tangents might be stimulated by an itch or inkling about the mood, atmosphere, structure of a new piece and what clues they offer for the meaning and expression of the piece. In these early stages I'm balancing the impulsive with the forensic. Mix in some nuts and bolts work - bowings and fingerings that seem to serve the emerging meaning and expression of the piece or chewing over words like molasses in the mouth to allow their meaning and physiological feeling to sink in. Think of the audience - the first- and the last-time listener. How is this music for them? How do I reveal it most vulnerably, powerfully, playfully, honestly? Then knowing that there always has to be a first performance and that the hidden depths are unlikely to reveal themselves in isolation from that integral chemistry of performer and audience. So being prepared - in that moment of performance - to launch into uncharted waters in pursuit of those hidden depths even if that means relinquishing the discoveries of the practice room. No one pays good money to see the practice room replicated on a stage, after all. How much do you make use of the opportunity to speak to the composer about questions of interpretations, if possible? What's your take on models, where you as a performer become an active part of the composing process? Talking about music can sometimes be illuminating but I've also seen it muddy the waters. I love to get in a room and really play and explore with a composer and try to move beyond the talking. Equally, if that opportunity doesn't arise, bringing a full-blooded and -bodied interpretation to the table and seeing what feedback arises can also work well. I've been an active part of the composing process to varying degrees - some overlap of skills and experiences can be useful. Currently, I'm enjoying collaborating with artists in a way where we really look after our own specialities and roles. I often think of what it must have been like at the West Side Story coalface - Bernstein, Sondheim, Robbins raising the stakes, trumping already fabulous ideas with even better responses, sharing skills and expertise at the same time as looking after their specialities. For quite a long time, improvisation was an integral part of what we now refer to as 'classical music'. Over the course of the 20th century, there have been various attempts of reviving that tradition. How much room for improvisation is there within your own approach and how do you approach it? For me, the keys to improvisation in both music and theatre are 'accept and build'. I try to be in that state all the time in my approach and on stage. Sometimes that has a creative consequence - making new things there and then in the moment - sometimes a re-creative one - shaping a known thing in a new way. Cellos and cello-playing are the least interesting things about cello music.